The Musee Yves Saint Laurent Marrakech will generously host the preliminary judging of the 18th Arts of Fashion Competition on May 24, 2019. The task of the Jurors is to identify 50 international candidates in Fashion and Accessories based on the students’ 2D submissions under this year’s theme of VERTICALITY. Special thanks to Bjorn Dahlstrom. - May, 2019: Jury session, candidates selected for the International Final will be listed on the Arts of Fashion website and inform properly by email as well as their professor. The competition is open to students studying Fashion, Art and Design anywhere in the world during the academic year of 2018-2019. Participants will not only represent themselves, but also their Schools, Colleges or Universities, as well as their Countries. - The 50 projects selected in the International Final of December 2019 cannot be presented in another US competition during the year 2019. Online registration: the registration fee is $40 for one category, Fashion or Accessories. Each candiodate needs to design a capstone collection of 3 models : The application materials should be completed as listed below. Format of each page: MUST BE – 8.5" x 11" or A4 / Letter – and on separate pages (do not try to bind or mount it or else) – name of the student and the school should be written on the back of each page with a pencil. To participate to the international Arts of Fashion Competition, applicants should register online. The application fee is $40 for the Fashion or Accessory category. After confirmation of registration each applicant should submit a file of drawings/illustrations of a mini collection of 3 outfits in menswear, womenswear or a mixed collection of both menswear and womenswear or 3 accessories. - Please read carefully the regulations and remember that the AoFF Competition is open to students registered in a School or University during the academic year and especially before the deadline to register and mail their project: April 1, 2019. - When a first student from an institution registered, the name of his/her School or University appears on the AoF website page of the competition. The main criteria for being part of the first 50 selected are truly creativity in Fashion design and concept, as well as a well-crafted project. - When the first jury meets in May, samples of fabric/material are also highly inportant in the student file. This is why we do not accept file submission online. April 1, 2019: Deadline for all application materials to be postmarked at this address: The Arts of Fashion Foundation - 555 California Street - Suite 4925 - San Francisco CA, 94104 - USA - Tel 415 734 7126 (use a sturdy cardboard envelope to avoid any damage to application materials). This unique competition is dedicated solely to celebrate emerging designers and their creativity. - Student projects received by April 1 are judged by a carefully selected jury of fashion design professors who travel on their own budget. - The 50 selected students - finalists - compete for scholarships allowing them to participate to the unique MasterClasses and apprenticeships with creative studios around the world. 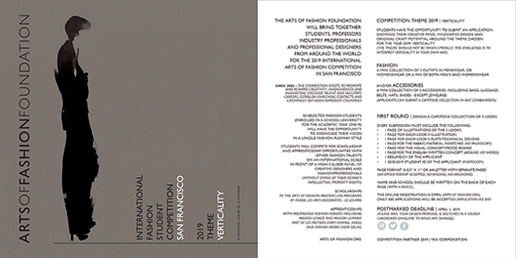 They present their work on the runway in front of carefully selected jury of fashion professionals in San Francisco with the support of YKK Corporation, VIP guests and long time volunteers and local partners including the San Francisco French American International School. May 2019: The candidates invited to continue on to the International Final will be announced on the AOF website, along with instructions and specifications for completion of the final projects by email as well as their professors. - Fashion projects should include shoes (US women size 9-10 / US men size 11-12 or ), and any particular stockings, undergarments, or accessories that the model should wear. - Every outfit is requested be sent in a separate transparent garment bag (with your name and address written on it), appropriate hangers. One precise instruction page is requested in a plastic sleeve (photos can be added if necessary) to help the dressers. When sending your project from abroad please indicate that it is a student fashion project and do not add value. If you add value you are responsible for possible custom taxes. October 16, 2019: Deadline for all selected projects to be postmarked and mailed. By filling out the form of registration from this page and mailing their projects, students declare to have read the general conditions for participation as well as the rules & regulations of the competition below and to agree to abide by them fully. Applications and Final Projects will be judged by experts and well-known professionals from fashion and design fields. In all matters concerning the course of the competition, including the selection of award winners and settling disputes, the decisions of the judges are final. All matters will be decided by majority vote and are not subject to appeal. In case of a tie, the President of the Jury will cast the deciding vote. Candidates will be presented anonymously to the first round Jury (made by fashion professors and designers) by the competition organizers. Jury deliberations for the second round Jury in December (made by fashion professionals and designers) will not be made public. Candidates maintain artistic ownership of their designs and final projects. By the act of participating in the Arts of Fashion Competition, candidates give permission to the organizers and sponsors to contact and promote them and their projects through a wide range of media: press, TV, internet, mailing, advertising, exhibitions, fashion show, etc… for a period of twelve months following the International Final of December. Winning projects cannot be presented in another fashion competition for twelve months following the International Final of December. If a winning project is exhibited or published in any media, mention of the Arts of Fashion Competition is required. In the event the AOF Competition 2019 is suspended or terminated for any reason, the organizers, as well as the sponsors, will not be held responsible in any way. The Arts of Fashion Foundation and its members, volunteers, guests and instructors, and the host University or Institution will not in any way be responsible for any accident, damage or loss of the final projects or candidates’ belongings during the course of competition, including workshops, masterclass, conference, exhibition, transportation, and all events. It is the responsibility of the participants to insure their submissions.